A perennial crowd-pleaser, this Mac & Cheese has the added twist of being flavoured with red onions and tomato and topped by robust flavour of grilled mature cheddar cheese. Super quick and easy and very, very tasty! Bring a large saucepan of lightly salted water to the boil. Add a few drops of olive oil and the macaroni and cook for 6-8 minutes until al dente. Once cooked, drain and keep warm in a colander over a saucepan of hot water. Sprinkle macaroni with a little olive oil to prevent it from sticking together. Melt the butter in a saucepan on medium heat. When the butter has melted add flour and stir into a doughy mixture - about 4 minutes. Remove from heat and add ⅓ of the milk at a time and mix well between each addition using a whisk. Add salt and pepper. Lastly add about a third of the cheese and return to the stove on medium to low heat and cook for 5 more minutes, stirring constantly, until the sauce thickens and the cheese has melted. 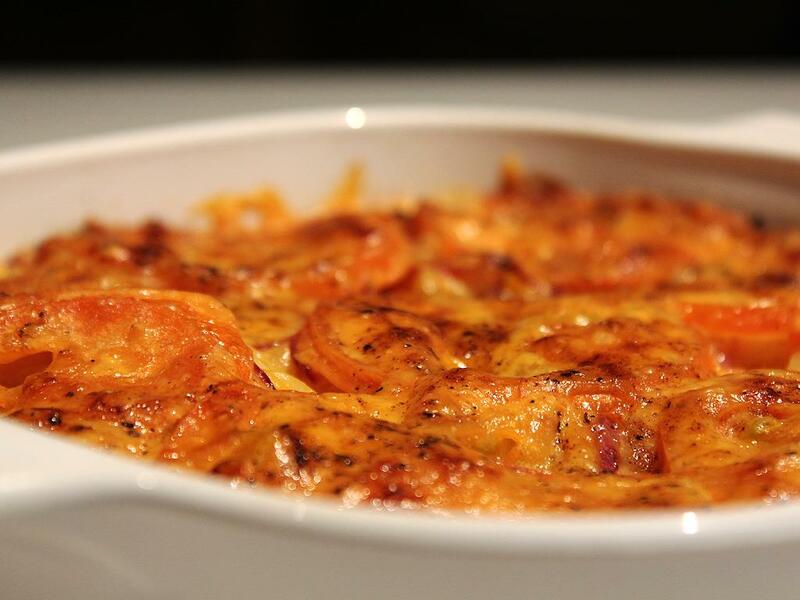 Put the cooked macaroni into a casserole dish. Pour the cheese sauce over the top and gently mix it in. Cover with slices of tomato and onion. Scatter the remaining cheese over the top and finally sprinkle with cayenne pepper (to suit your taste). Bake in the oven for 20 minutes until the cheese turns to a light brown crust. Remove from the oven and allow to cool for 5 minutes before serving.